Registered Massage Therapy like you've never experienced it before! Yes... Ashiatsu is considered Registered Massage Therapy! If you have coverage for massage therapy through your insurance provider, Ashiatsu will be covered. 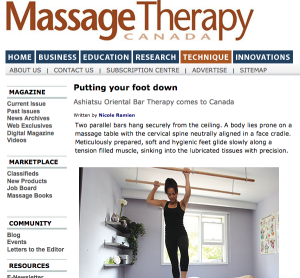 Nicole co-authored this article about Canadian Ashiatsu training with Terri Rowan, RMT. Spring 2014 Issue, Pages 26-28. Nicole was interviewed by Joel Haslam of CTV Ottawa's 'Regional Contact' in February 2015 about Ashiatsu in Canada. Luckily there are several RMTs who have trained with NRG Medicine and currently practice Ashiatsu in the Greater Toronto Area!